Gary Anderson is someone who likes to get things done right. So when the former Alberta rancher and businessman decided to build a home on Vancouver Island, he went all out. Way out. 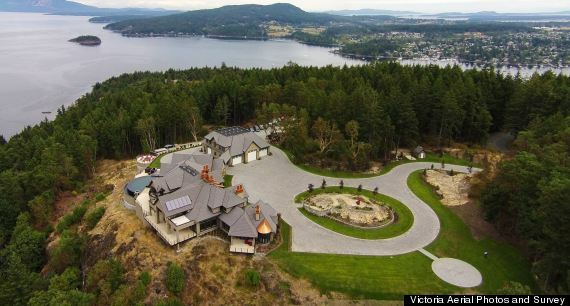 Anderson, 55, and his wife developed 43 acres of oceanfront property into a jaw-dropping 16,216 sq.-ft. home with seven bedrooms, six full bathrooms, a concrete tiled roof, solar-heated infinity pool, outdoor pizza oven, and 10 granite patio/decks. "We have very famous people that live on the island, and it was just a dream of mine that came to me that you need a helipad," Anderson told The Huffington Post B.C. in an interview. "If we sell it to a rich person that has these Lear jets and helicopters to fly back and forth, they don't want to get in a car and go, they just want to get into their home." This month, Anderson listed the property, which he's dubbed "The View," for $11.5 million. But he and his wife didn't plan on building a stunning house only to sell it. "My goal at first was to just build a home for us; we didn't want a really big home," said Anderson. "Everybody we talked to said, 'You really need a home to fit the property.' And because the property is 43 acres, to build a little home on it really doesn't make sense." It became a fun challenge for the couple, who lived first in an RV, and then in a two-bedroom suite above the on-site workshop. "It's kind of my dream. You want something in life that's done well. I always like big projects. Everything I've done, I've done big. I farm big, I kind of ranched big. We did construction on a big scale," explained Anderson. "I lay awake at night dreaming of how to make it better." After almost four years, it's hard to see how the home could get any better. The helipad isn't even the most impressive amenity. 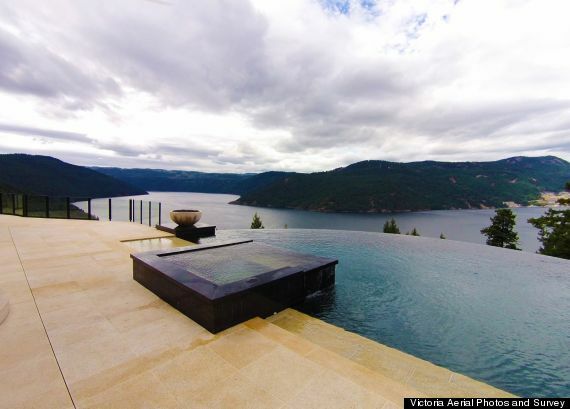 An infinity pool optimizes the unobstructed views of Saanich Inlet, easily making you forget that you're only a 20-minute drive from downtown Victoria. "I'm very fussy and I like things done right," said Anderson, who moved from Alberta to B.C. in 2010. "I didn't skimp on anything. Everything is top line." Anderson is proud of the fine details — from Swarovski crystals on the chandeliers, to the custom wrought-iron electric gates, to the warming drawers in the kitchen. 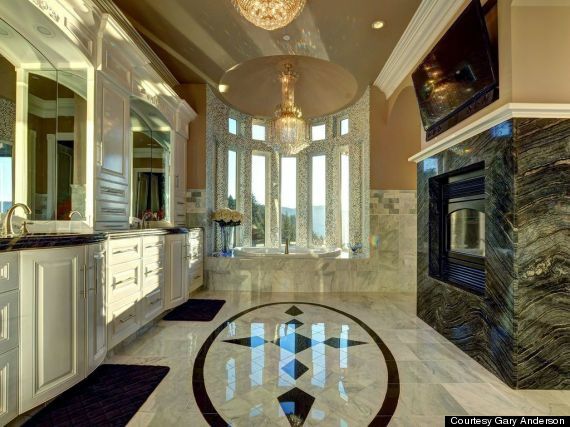 Not to mention a master bath with a TV, fireplace, and, ho-hum, another ocean view. A 3,600 sq.-ft. workshop garage includes vehicle and motorbike lifts for any automotive buff, an RV bay, in-floor heating, and even a welder plug-in. But Anderson will be OK to leave his baby behind, as he and his wife (who have nine children between them) do some travelling. Then they'll likely do it all again. "We'll either buy another one or build another one," said Anderson. "I'll stay busy, maybe do condos or something else."